Honeysuckle caravan, near New Quay, West Wales. Honeysuckle Caravan is an Atlas Orlando super and is situated in its own private fenced off garden on a working farm just 2 miles from the popular pretty seaside town of New Quay with its many pubs and restaurants where you can watch Dolphins from the pier. 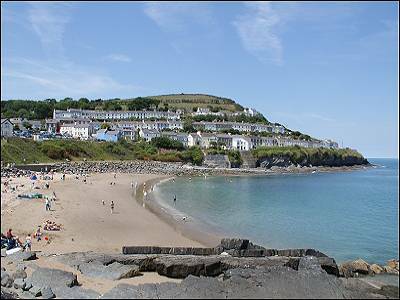 There are several lovely safe beaches in and around New Quay and daily fishing and Dolphin watching boat trips are available. A mature well behaved dog welcomed. Weekly bookings start on Sundays. This is a very comfortable caravan located on a farm, on the edge of the small village of Cross Inn, approx. 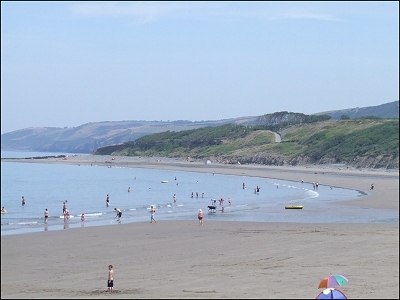 2 miles - about a 5 minute drive from New Quay. It is a short walk from the centre of Cross Inn where there is a pub (with food) and a couple of small food shops. The caravan sleeps four in one double and one twin bedroom. bed linen is also provided. There is a shower room with wash basin which can be accessed from either the double bedroom, or the hallway. The WC and hand basin are separate. The caravan is fully equipped with TV & DVD, fridge, microwave etc. bed linen is also provided. It is in a private spot, fenced and with its own lawn, picnic table and chairs. Regret no children under 12 yrs. All charges are fully inclusive - including one mature well-behaved small or medium dog. Honeysuckle Caravan is at Cefyngwyddil Farm at Cross Inn near New Quay.